From Walkers to Klingons, actress Sonequa Martin-Green is gearing up for a different breed of science fiction with Star Trek: Discovery, the CBS All Access series that’s set to become the first serialized entry into this most beloved universe since Enterprise bowed off the airwaves more than a decade ago. It’s been a long time coming, too, after production woes beset CBS’ live-action series during the formative stages of development. But after drafting in co-showrunners Gretchen J. Berg and Aaron Harberts to fill the void left by Bryan Fuller – a busy schedule along with Fuller’s ongoing commitment to Starz’s American Gods series were to blame – Discovery was back on track, and has since recruited a star-studded crew in preparation for its journey to the cosmos. The Office star Rainn Wilson and Jason Isaacs are the latest cast members to climb on board, after the latter agreed terms to play Captain Lorca. Despite his central position on the deck, Lorca isn’t actually the main character of Star Trek: Discovery; instead, that title belongs to Sonequa Martin-Green’s Lieutenant Commander Rainsford, who is set to serve as Lorca’s Number One on board the U.S.S. Discovery. In light of last night’s gripping season finale of The Walking Dead, though, CBS has unveiled the true identity of Martin-Green’s character: First Officer Michael Burnham. Turns out Rainsford was merely a production codename, though fans will now be left to ponder over the backstory of one Michael Burnham. 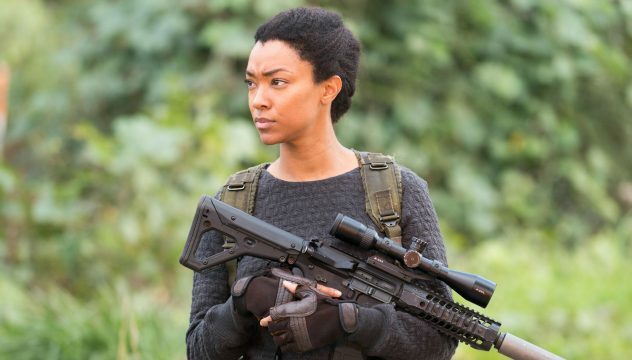 Barring the above Tweet, CBS is keeping things under lock and key for the time being, so it’ll be some time yet before the network offers up some context to Sonequa Martin-Green’s character. Being the first officer on the shipis going to be a wild ride because we haven’t seen that happen before in the Star Trek cannon, we haven’t seen the story be told from the perspective of the first officer rather than the captain. It’s going to open up so much potential for new storylines because not being the captain automatically gives you a different perspective. It’s going to be a wild ride and everybody on board — in front of the camera and behind — I’ve been floored by the performances on The Walking Dead from the beginning and I’m going to be astounded again by the people we’ve got assembled on Star Trek. I’m really excited. With a full cast now in tow, Star Trek: Discovery is set to begin filming imminently. A late 2017 premiere looks to be the target, but there’s every chance CBS will hold fire until early next year.